Toothaches don’t just arbitrarily pop up on their own and then disappear when they feel like it; there is always an underlying cause for tooth pain. Sometimes, the cause is something as simple as worn enamel that increases sensitivity. At other times, gum recession is to blame. 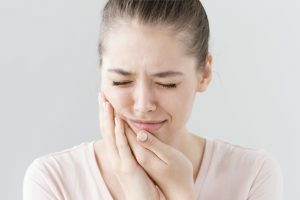 If you know why your tooth is hurting and you’ve already spoken with your dentist in Spring Lake about the issue, there may be no reason to be alarmed by your pain. However, there are other times when a toothache is huge red flag that should have you heading to your dentist’s office right away. Let’s talk about some signs that mean you should seek immediate treatment. If a fever or chills accompany a very painful toothache, you should make an emergency appointment with your dentist. These are signs of an infection that, left untreated, could cause serious damage to both your oral and overall health. Many times, an infection manifests itself as an abscess in the gums or tooth. If you notice that one tooth is darker than the ones around it, or there is a pimple-like sore on your gums, it’s quite likely that you have an abscess. Some dental treatments, such as professional whitening, will temporarily make your teeth more sensitive. Environmental factors, like cold air or a diet that contains lots of acidic foods, can also contribute to sensitivity. However, if the pain caused by these things lasts longer than you expected, you should visit your dentist to find out if there is an underlying issue that needs to be treated. Sometimes, a toothache is serious enough that the pain radiates to the surrounding areas, such as the jaw or ear. In other cases, an issue with jaw alignment can cause problems with your teeth. To discover which is the case with you, and to find relief from your pain, a visit to your dentist is in order. Severe mouth pain is always an indicator that you should see your dentist as soon as possible. If your toothache makes you dread the thought of eating, or if it makes you want to stay in bed all day with an ice pack on your face, it’s fairly safe to say that something serious is going on. You may have an infection, severe tooth decay, or another oral health problem that requires professional treatment. Remember, a toothache isn’t an oral health problem; it is the symptom of an oral health problem, which won’t go away on its own. If you are experiencing abnormal pain in your mouth, please see a dentist right away for treatment. Dr. Edward Dooley grew up in Spring Lake and has a true passion for serving the smiles in his community. He has been practicing dentistry for decades, and he enjoys putting his experience and expertise to use to help his patients achieve excellent oral health. If you are concerned about a toothache or are just ready for your next checkup, contact our office at 732-974-2288.